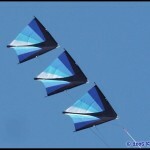 Type of kite: Rhomboid design, stackable ballet and precision kite. 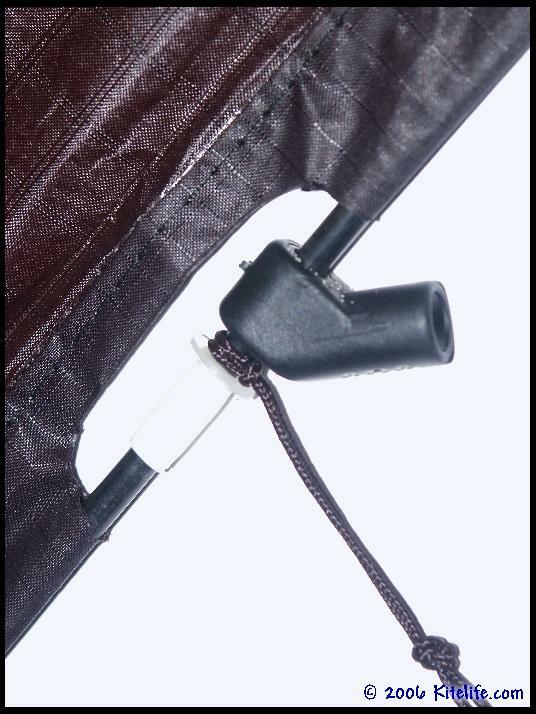 Materials: Icarex .6 oz ripstop polyester sail, .157 and .210 pultruded carbon, APA fittings, 170# dacron bridle, 100# spectra train lines and vinyl nosepiece. 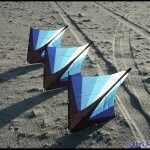 One of the most overlooked kites over the last 20 years, the Mirage is like nothing else ever made… Often mistaken for a traditional diamond kite, the Mirage is actually a Rhomboid configuration which offers a pre-shaped wing and creates one of the most precise and maneuverable kites on the market, both past and present. 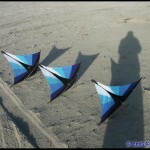 Unlike a Rogallo, or “delta” shaped kite, the Mirage can turn literally on a dime and stall with the flick of a wrist, creating some highly unusual flight characteristics. 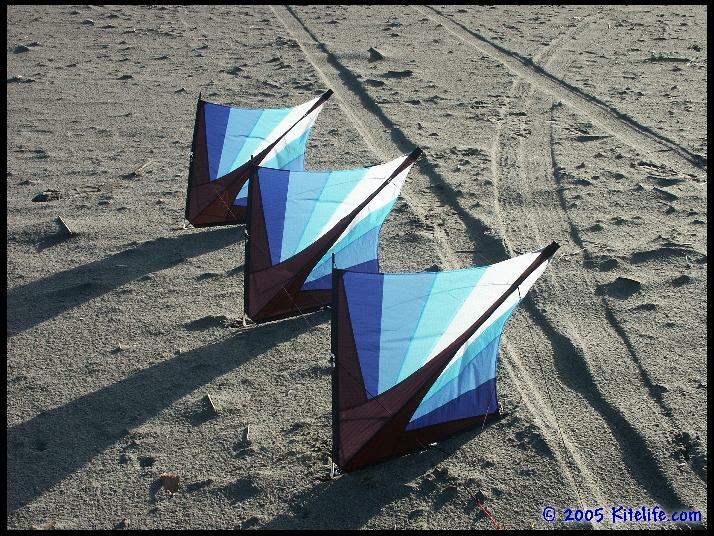 Designed by Mike Jones of Jones Airfoils between 1982 and 1984, the Mirage was created with a great deal of research and development, thanks much in part to inspiration gained from Mel Govig, Pete Ianuzzi and Red Braswell, all legendary kite figures in their own right. 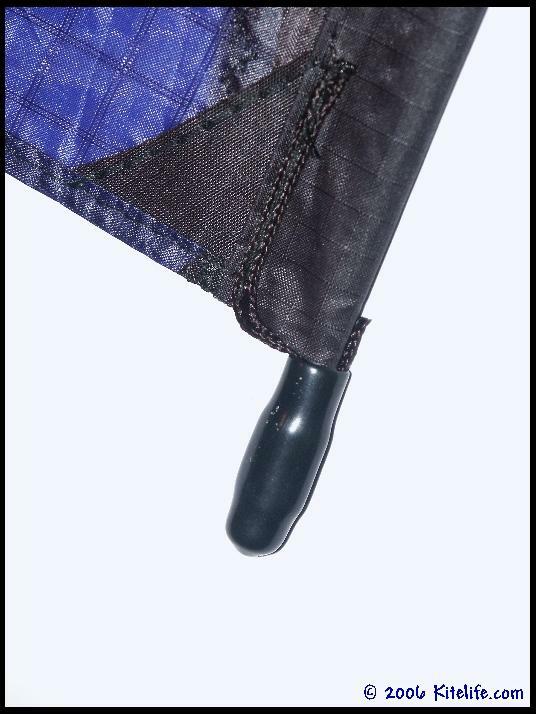 Stitchwork and sail manufacturing on the Mirages is excellent and detailed, described on the Jones web site as 3M 9460 heat bonded w/ 40wt color matched polyester thread reinforcement… The thread is matched to the color of each panel! 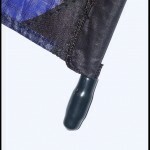 The trailing edges are curved (slight scallop) as well. 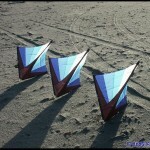 There are 33 panels in the sail, or 11 per kite, making the Warbirds incredibly sharp in the sky against any background. Design and assembly is very straightforward, making the very rare replacement or repair of parts nearly painless… And since pultruded graphite rods are standard fare, parts are inexpensive and readily available. 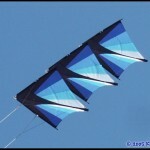 The spine is secured with a velcro closure, wing tips are secured with a tension line and end cap, noses are assembled with vinyl tubing and weights on the front kite. 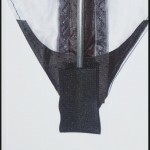 The two fittings (for the cross spar) on each kite are APA, with plastic washers to keep the bridle points in place. Bridle is 170# dacron, two piece, two adjustments… Tuning is done via two larks head knots where the pig tails are attached to the bridle. 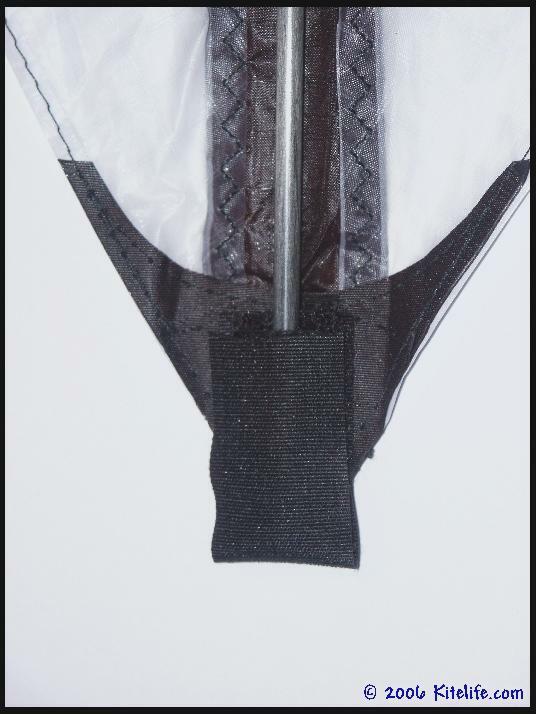 The top attachment is just below the cross spar fittings, and the bottom attachment for both sides are where the T piece would be on a traditional kite “delta” kite… About 3/4 way down from the nose, on the spine. 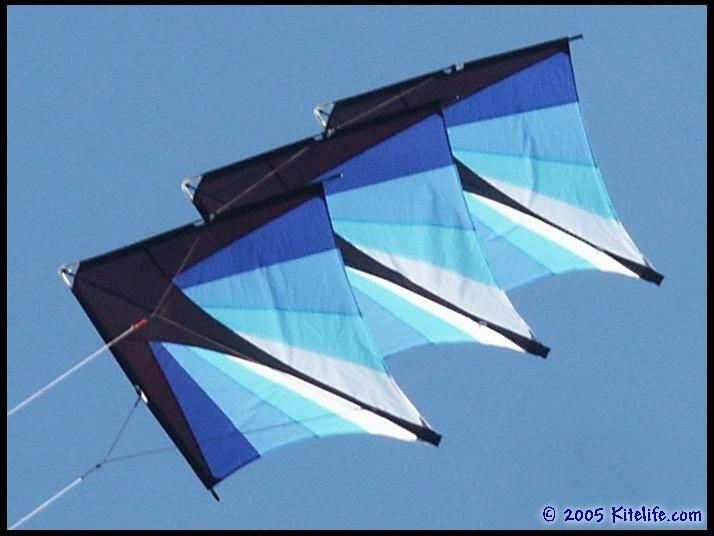 There is definitely a sweet spot on the bridle, since setting it too far down dumping air, making launching and keeping up speed a bit of a challenge… Having it set to far up tends to dumb down the steering, and take the distinct punch out of these kites. The simplicity of the configuration however, makes adjusting incredibly simple… I ended up flying with the tow points about 1/8″ below the marks, and ended up leaving it there. 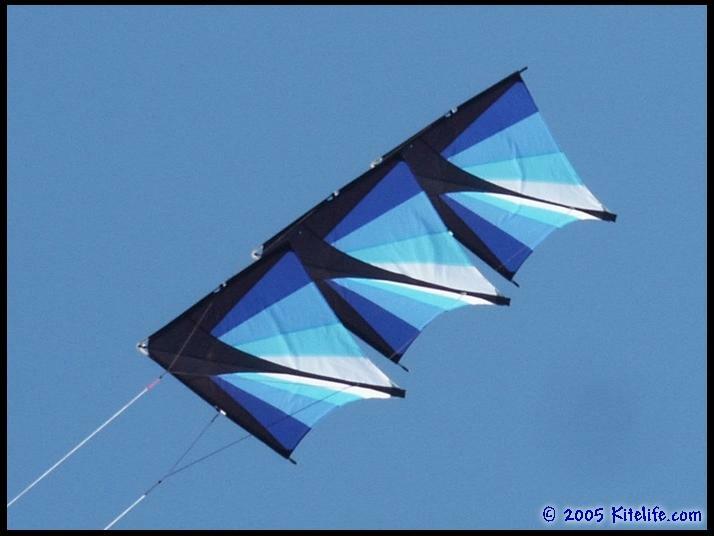 Talk about an ideal high wind kite – while the Mirage seems at home in anything over 5mph, it has the highest wind range of any kite I’ve ever had the pleasure of flying! Matter of fact, I’ve added a Warbird stack to my own competition bag for anything over 25-30mph, just in case. 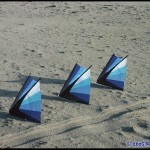 I actually had an experience in 1992 at the Outer Banks event in North Carolina where winds were gusting up to 60mph and the competition was still held despite the conditions… 90% of the fliers switched to Mirages, which not only handled the high winds well, but didn’t pull unreasonably. 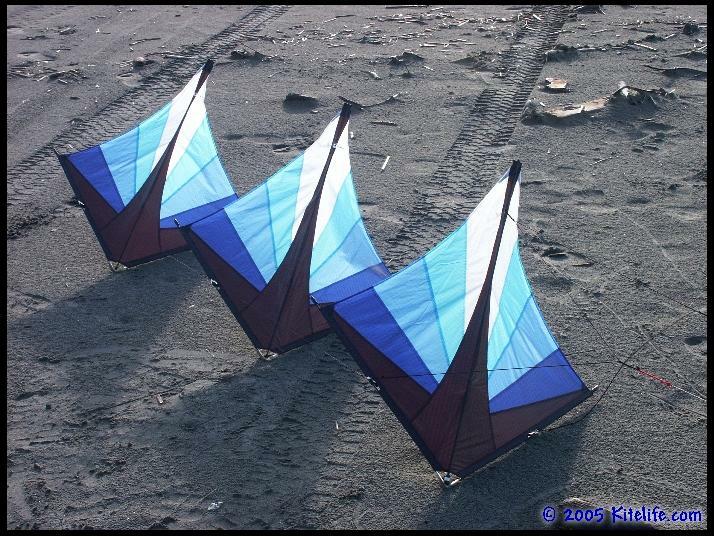 The model we tested (and flew at Outer Banks) includes the currently optional “Trusstix”, pronounced truss-sticks, which provide two diagonal king posts on the lead kite instead of the usual single king post that comes with each kite in a standard three pack. 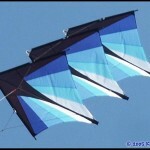 As far as I know, the true upper wind range for these kites (equipped with Trusstix) has not been discovered in the 20+ years they’ve been around. Pull is solid, but not overpowering… And sensitivity, well, that’s a whole ‘nother topic. 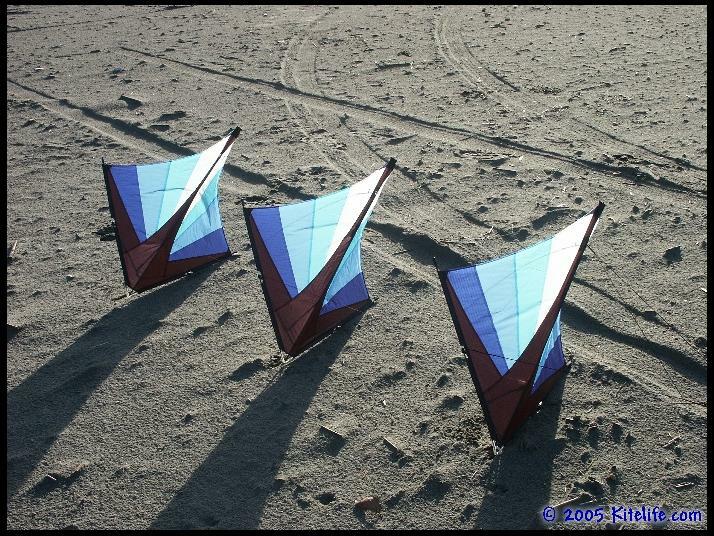 As I mentioned earlier, these are some of the most responsive and precise kites you’ll ever fly… You can be cruising across the window in a ground pass just one foot off the ground, give a hard yank on the bottom line and send it in a tight spin that will actually clear the ground and send you speeding back into the sky! 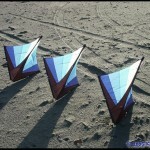 One of the neat things about these “would-be diamond kites” is that they have a stall point, allowing you to actually set them down on their tail points and balance them there with some practice… This same stall ability allows you to do some very interesting turns, rotating well within their own axis. 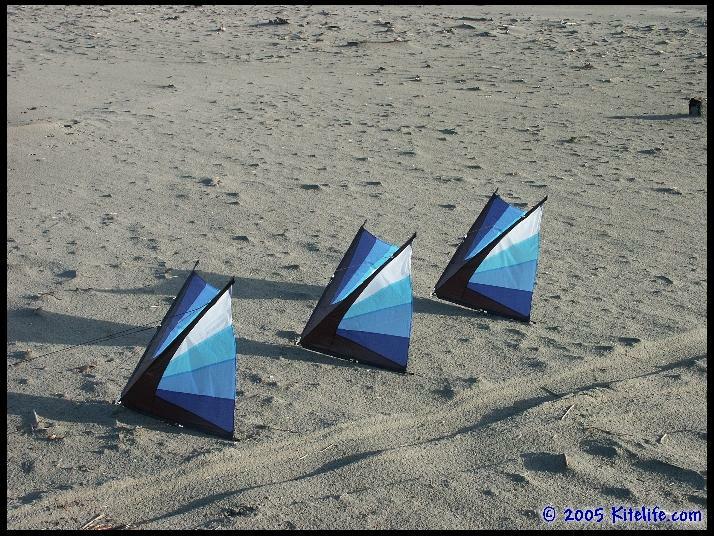 Launching is a breeze, simply pulling them up onto their nose(s) and giving a swift pull on the uppermost line sends them sailing back into the air… Due much in part to their stalling ability, there is a slight hesitation in somewhat lighter winds, but it is easily overcome by drawing back on the lines and loading up the sails with wind. 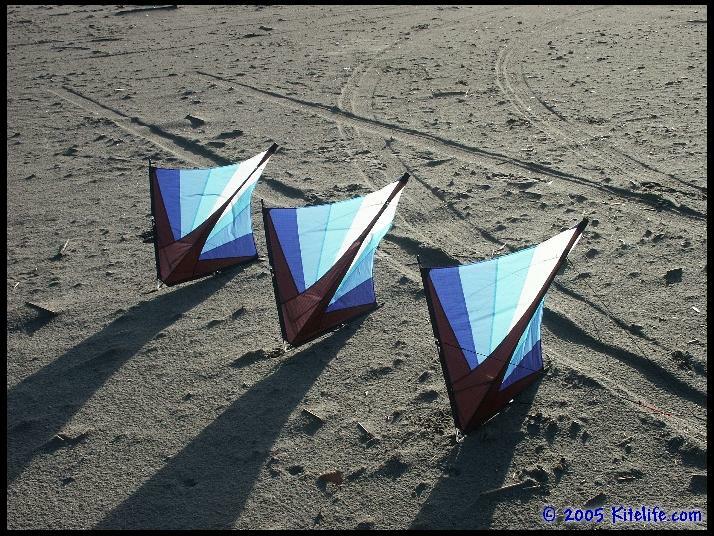 And, while it’s not exactly a “flight characteristic”, when you’re ready to catch your breath from all the zipping around… Just give them a gentle crash (set them down on the nose), lay them back, and walk away… The wind does all the work in keeping them on the ground, no ground stake required in sand or on grass. I’ve been able to do as many as 16 square cuts from the top of the window… Or, imagine 10 down turns in stair steps… You might not be able to flip these on their back for multilazies or do roll ups, but the Mirage 3 pack will take everything you throw at it for precision, and come back begging for more. 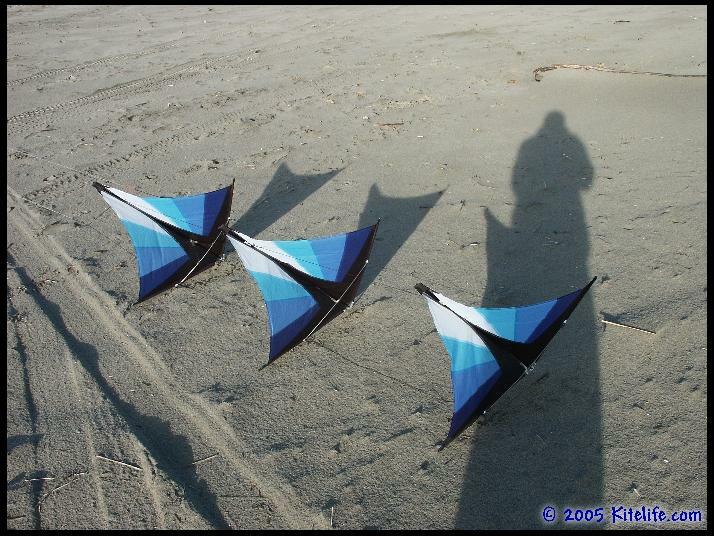 These kites are fast too… While you can cruise them around the sky with relative ease, sending them through quick precision combinations will leave you panting. There’s no comparing these to anything else… You might as well compare a hummingbird to a tank. 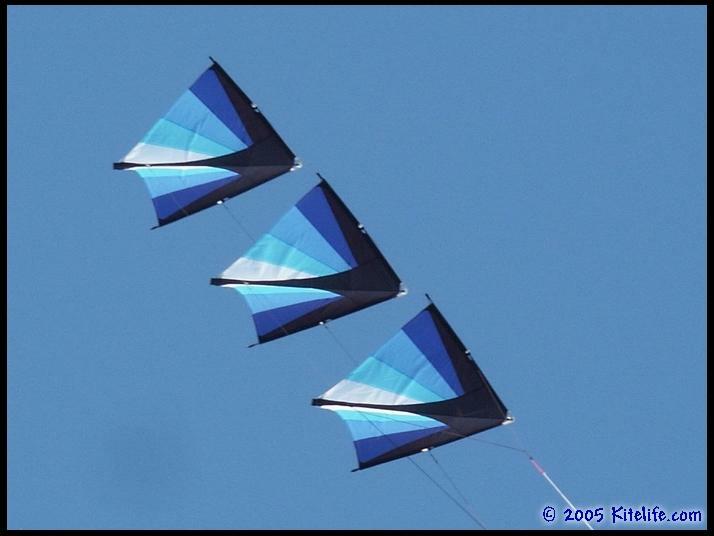 The key word here is FUN… The unique nature of these kites and unusual flight characteristics always leave me grinning like a fool. 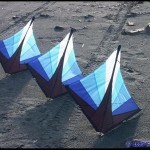 Forget the controversy, just try these kites… They’ve carved their way into history, and while forgotten in many circles, they still hold their own as an amazing work of engineering and performance. 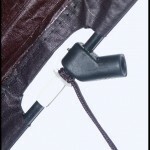 A worthy addition to any bag, the Mirage is worth every penny… Matter of fact, if you see me at an event just let me know and I’ll be happy to let you try mine! This entry was posted in 2006, Dual Line, General Topics, Issue 46 (Jan/Feb), KL Archive and tagged jones airfoils, mirage, review.